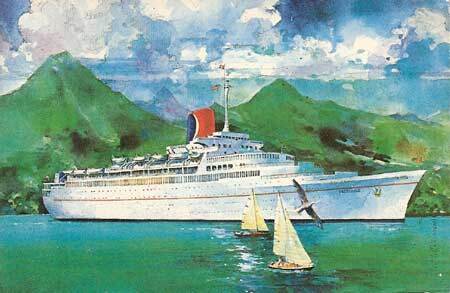 These pages are devoted to postcards and photographs of the Carnival Cruise Line. An alphabetical list of ships covered on this page is shown below. The Table beneath gives links to complete postcard history pages on selected individual ships. Below the table are official postcards of the fleet in chronological order. 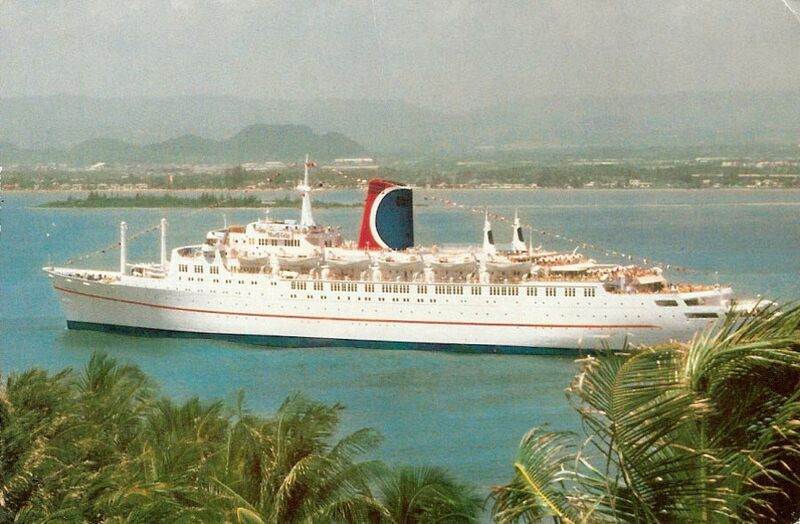 Carnival began operations with the ex-British liners Empress of Britain, Empress of Canada and Transvaal Castle, and went on to become the world's largest cruise line, owning Holland America, Cunard, Princess, P&O and Costa. They also bought a 25% interest in Airtours, although this share was subsequently sold. This page shows the secondhand ocean liner tonnage which Carnival began operations with. Carnival-Page 2 shows the four first generation cruise ships of between 35000 and 47000grt. Carnival-Page 3 shows the eight second generation 70000grt cruise ships of the Fantasy Class, delivered between 1990 and 1998. Carnival-Page 4 shows the third generation Mega-Ships, beginning with the Carnival Destiny of 1996. Carnival - Page 1 - Secondhand ocean liner tonnage - This Page! 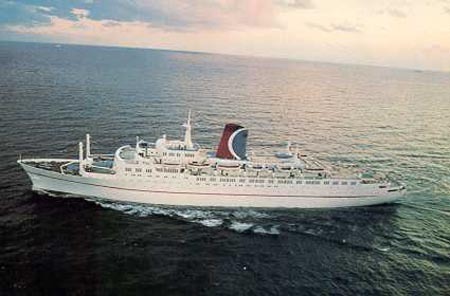 Mardi Gras was built for Canadian Pacific as the Empress of Canada, and made her maiden voyage from Liverpool to Canada on 24th April 1961. In 1968 she received the latest CP funnel design, which was adapted as the Carnival symbol when sold to them in February 1972, after completing her 121st and last Atlantic crossing in November 1971. 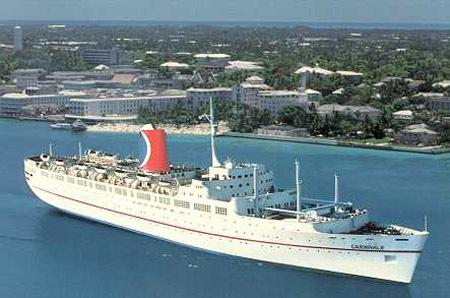 As the Mardi Gras, she became Carnival's first ship. Despite extensive internal changes, her external profile remained largely unchanged through Carnival and subsequent owners. 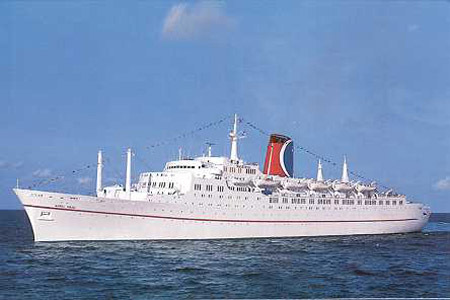 Following the arrival of new purpose-built tonnage for Carnival, Carnivale was sold to Epirotiki in 1993, becoming Olympic, Star of Texas, Lucky Star and finally Apollon. 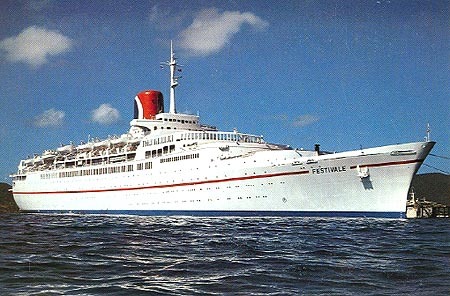 In 1999 she was chartered to Direct Cruises, for a series of cruises from the UK, marketed as Apollo. 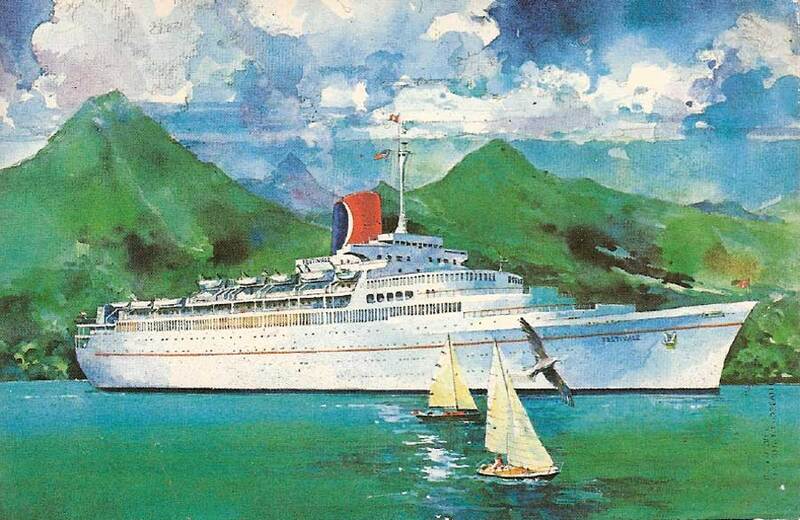 Direct Cruises were acquired by Airtours, in which Carnival later look a 25% interest. 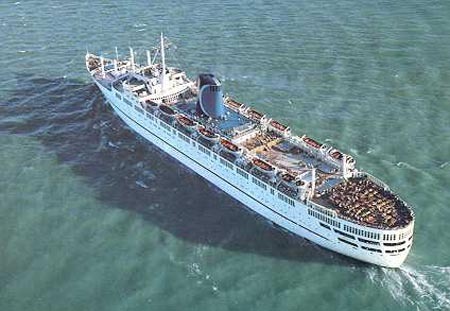 In 2000, the scheduled cruises of Direct Cruises were cancelled, and Apollon returned to Greece to be laid up, but was in service again in 2001 following the late delivery of Olympic Explorer. Carnival official card of Mardi Gras, with funnel logo modelled on the final CP colours. Appears to be a retouched image of the final CP colours. Carnival official card of Mardi Gras. 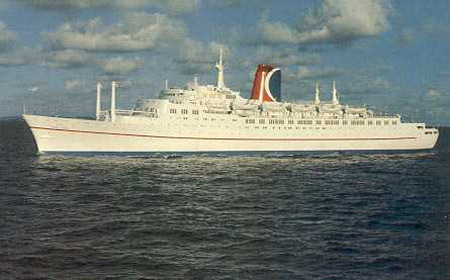 It has Carnival logo and printing "Posted on Board TSS Mardi Gras". Externally little changed from CP days, and still a very attractive ship. Editions FISA card of Mardi Gras (s/n 7). 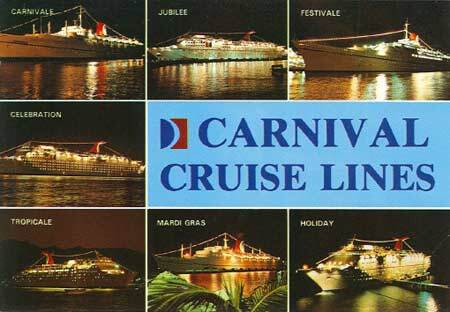 Carnival fleet postcard, including the Mardi Gras. 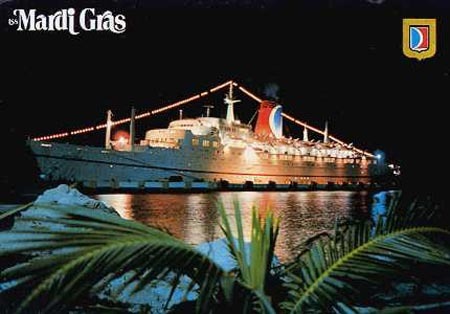 Carnival fleet postcard FISA AC-13, including the Mardi Gras. Carnival fleet postcard FISA AC-13 A, including the Mardi Gras. 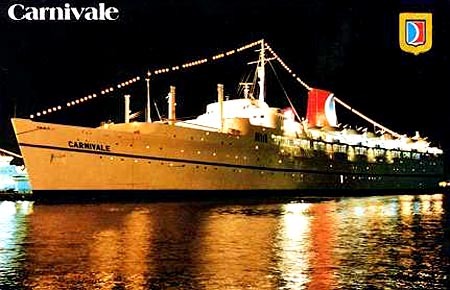 Carnivale was built as the Empress of Britain in 1956 by Fairfields of Glasgow. She was sold to the Greek Line, and re-entered service for them as Queen Anna Maria in 1965, running a fortnightly service to New York calling at Naples and Lisbon. 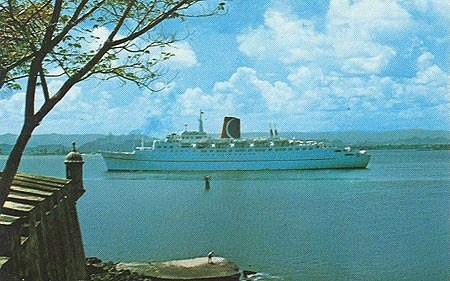 Following the collapse of the Greek Line, she was sold to Carnival, joining the the Mardi Gras (ex-Empress of Canada) in 1975 as the Carnivale. 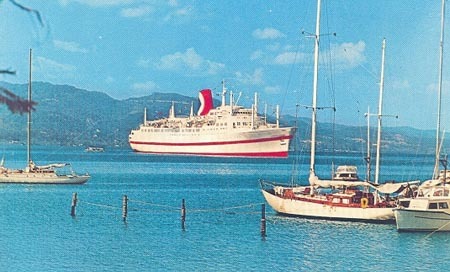 Following the numerous new deliveries to Carnival, she was transferred to subsidiary Fiesta Marine Cruises as Fiesta Marina. 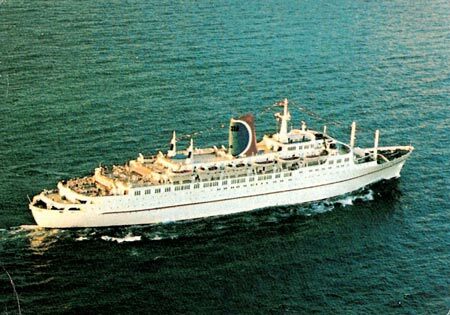 She was sold again in 1994 to Epirotiki as Olympic, and has recently been on charter to British tour company Thomson as the Topaz. Carnival official card of Carnivale, with funnel logo modelled on the final CP colours. Still an attractive looking ship. Carnival official card of Carnivale, showing Greek Line additions aft, which at least followed the original lines. Carnival official card of Carnivale. Carnival official card of Carnivale (s/n 9). Editions FISA card of Carnivale (s/n 10B). 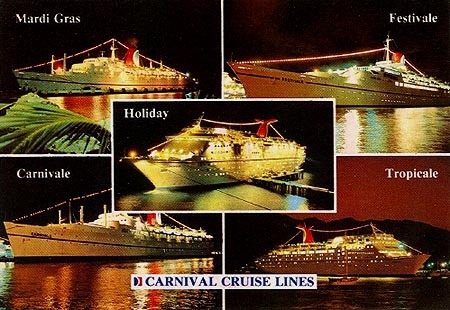 Carnival fleet postcard, including the Carnivale. Carnival fleet postcard FISA AC-13, including the Carnivale. Carnival fleet postcard FISA AC-13 A, including the Carnivale. 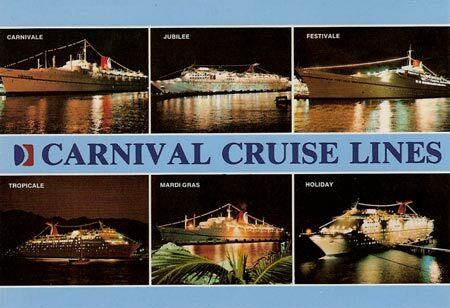 The front cover of the Carnival Cruise Lines official postcard album of Carnivale. 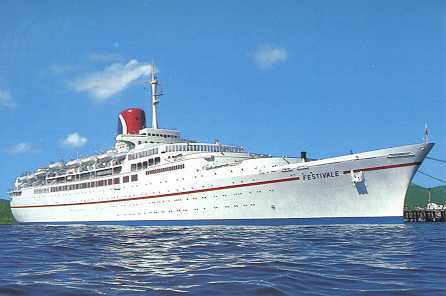 The Transvaal Castle was launched in 1961 by John Brown & Co, Clydebank. 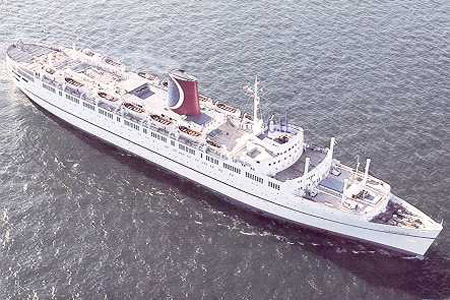 She was delivered to Union-Castle Line, and served on their route to South Africa from Southampton from 1962. 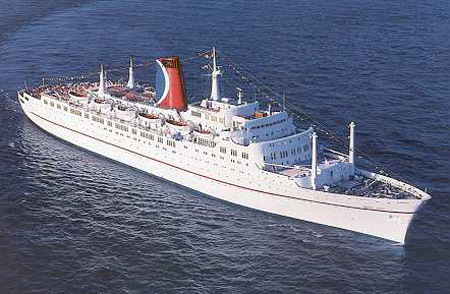 She remained in Union-Castle colours only until 1966, when she was transferred to the South African Marine Corp (UK), remaining on the same service under the British flag, with Union-Castle crew and management as S.A.Vaal. In 1969 she was transferred to the South African flag. S.A.Vaal was withdrawn in Southampton on October 10th, 1977 and sold to Carnival Cruise Line, who rebuilt her in Japan with extra decks, almost doubling the passenger capacity. The external appearance was not spoilt, however, and she has remained the handsome ship of Union-Castle days. 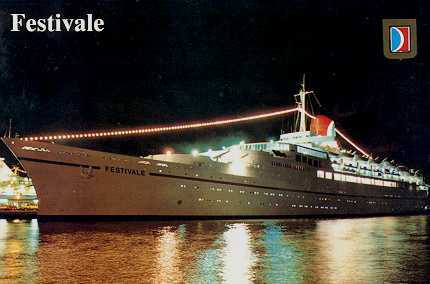 She returned to service in 1978 as Festivale. 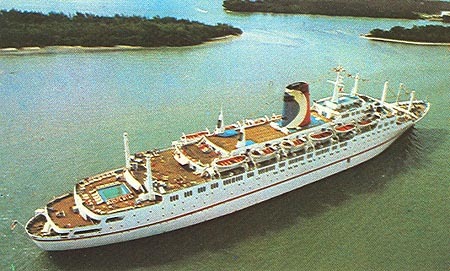 Following the delivery of purpose-built cruise ships to Carnival, she was sold to Dolphin Cruise Line in 1996 who renamed her IslandBreeze. 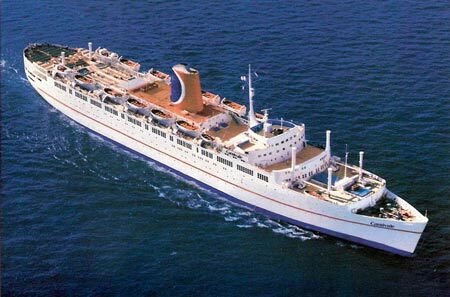 She was chartered to UK holiday company Thomson during the late 1990s, and passed to Premier cruises with the rest of the Dolphin ships. 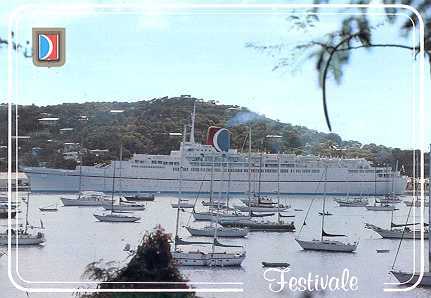 Carnival Cruise Lines official card of Festivale. Slightly different to the card above. 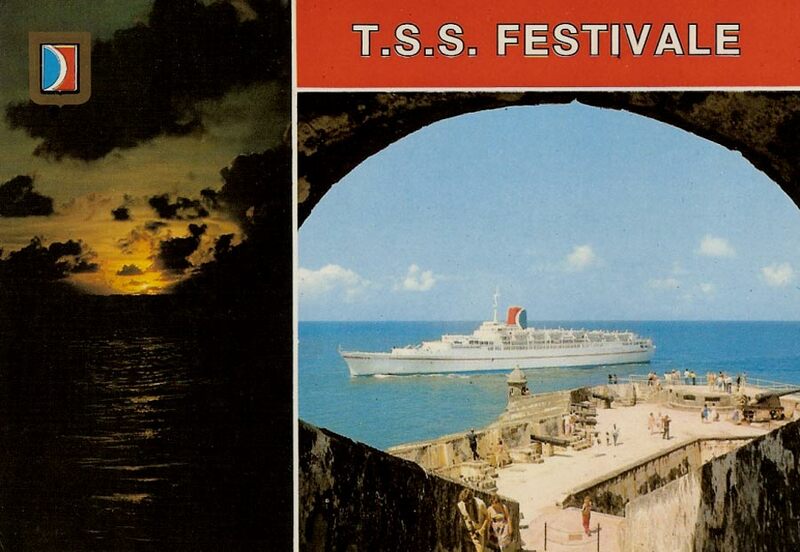 Carnival Cruise Lines official card of Festivale (Ediciones FISA, Barcelona s/n: 16). Carnival Cruise Lines official card of Festivale (Ediciones FISA, Barcelona s/n: 18). 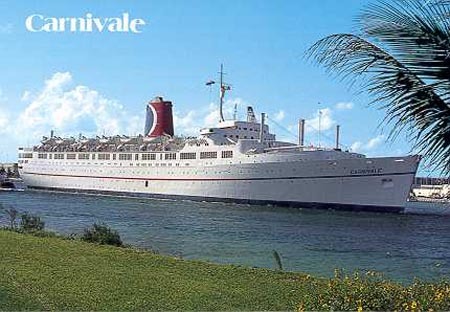 Carnival fleet postcard, including the Festivale. 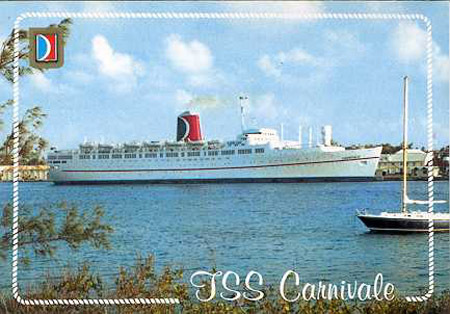 Carnival fleet postcard FISA AC-13, including the Festivale. 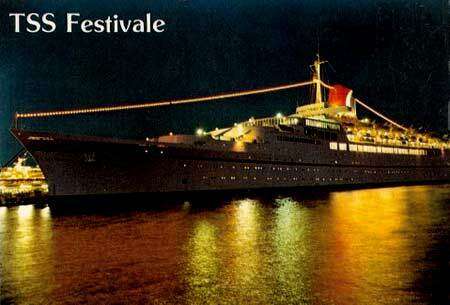 Carnival fleet postcard FISA AC-13 A, including the Festivale.